Diorskin Star Foundation – New Holy Grail?! 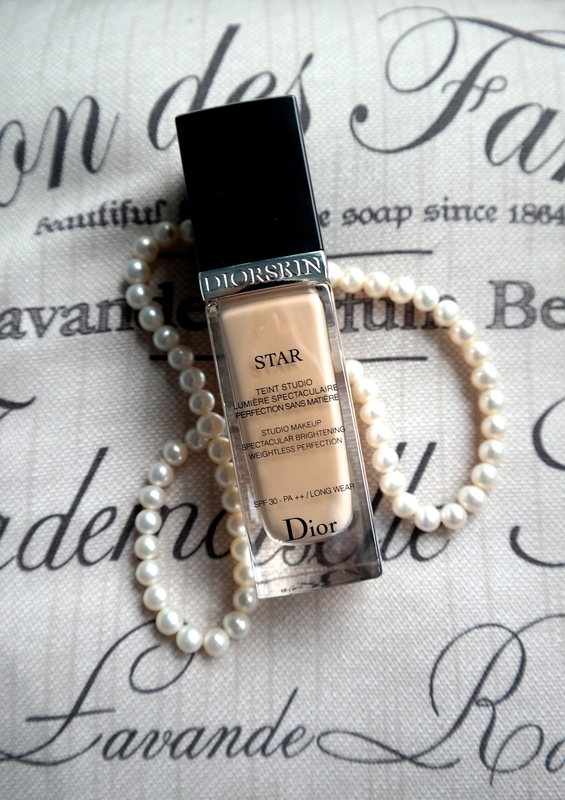 today I’m giving you a review on the lovely Diorskin Star foundation. I’ve been trying this amazing stuff for the past 2 weeks already and I’m so excited to share my thoughts on it with you guys. One thing, that is probably the most important thing for me, when it comes to doing my makeup is having that look of a flawless skin. I don’t always need dramatic eye makeup or a bold lip but one thing I always strive for is a flawless base. It just gives me such a confidence boost. Now my skin isn’t incredibly awful looking, however, I just feel so much better covering up some little flaws because let’s face it: we all have them. When I try a foundation, I expect it to even out my skin tone and cover up some flaws. I want it to feel light on my skin and most importantly I want it to match my skin tone and I often have trouble with this part because I’m so pale and most Ivory shades aren’t really Ivory. But this little beauty does all of those things and is a perfect match. I’m in the shade 010-Ivory and it’s actually just perfect. When I apply this on my face it looks just like my skin only about 10 times better. You seriously wouldn’t be able to tell, that I was wearing any foundation because it melts into my skin and blends so perfectly. Another plus is the formula. It’s incredibly light and feels really hydrating. Especially if you’re more on the dry side, like me, you should give this ago. It’s not drying at all, doesn’t get cakey and just looks incredibly natural. Additionally this foundation uses a formula that doesn’t clog up your pores “A new generation of hollow silica beads captures and diffuses light in a correcting halo with no shine. At the same time, colour-filter pigments neutralize colour imbalances to recreate the perfect light.” Through this new formula your skin can actually improve, because it covers anything you want to cover without blocking it or clogging anything up. Now to another important part: the finish. It’s actually a bit tricky to describe the finish this foundation leaves. It’s definitely not matte but it’s not dewey either. It’s somewhere in between and it gives you that glow form within kind of looks. It just gives your skin a healthy, natural and illuminating look. There’s not other way to describe it really. I know this almost sounds like a love letter but I’m honestly beyond impressed with this foundation. I’m so picky when it comes to my foundations. Most of them are either not my exact skin tone, so it takes a lot of effort to blend it all well or they are too drying or feel too heavy or don’t last long enough. I usually always find something I dislike butI haven’t found anything, that I don’t like about this foundation yet. My skin has never looked this good and healthy, and stayed that way all day, and I’ve tried so many foundations already. I wouldn’t say it’s my new holy grail just yet because I’m on my first bottle and it’s still very new but I think there’s a good chance it might become one though.